Fencing around a construction site or work area. 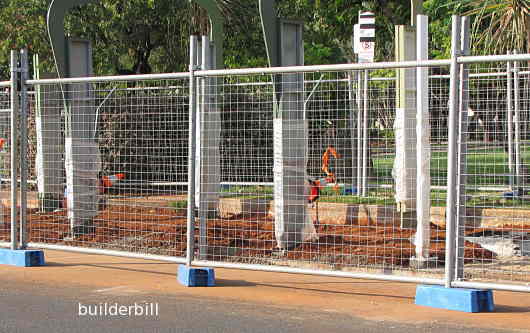 A modular panel system making a temporary construction and safety fence around around a worksite. These type of panel fences are sturdy yet simple to set up and are easy to modify. They can have various gates and extra support braces to the gate posts. The blue bases are just a thin shell of a polypropelene type of plastic that is filled up with concrete to add to the weight. Simple bolted clips hold the panels together.